Lucha Frutos offers Mexican-inspired dried fruits, mixed nuts, and candy. We love the spicy peanuts, peas, and churritos mix and the chile watermelon gummy bears. So, we asked the founders how the Anaheim-based company got its start. What sparked you to launch Lucha Frutos? 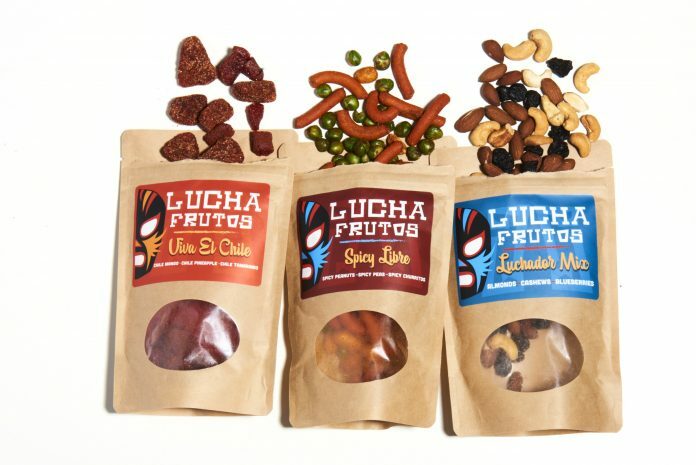 Lucha Frutos was started to serve Mexican-inspired tasty snacks that can be healthy or just simply sweet and full of flavor. What went behind designing the packaging? We used a Luchador as our logo because like Lucha Libre wrestling, it is fun, colorful, and represents our culture. It also represents lucha or fight. Starting a new business is never easy and to be successful, you have to brand your product to appeal to your customers, which is basically what a Luchador must do to build a fan base. We wanted to highlight Mexican tastes and cultures by using mostly Mexican products like chile. Almost all our products contain it. What do you think Lucha Frutos is perfect for? We think our snacks are great on the go. Our goal was to create a variety of snacks to enjoy throughout the week. We have healthy, spicy, and sweet choices. We don’t talk about ourselves as a way to relate to our brand. We want to embrace what a Luchador stands for; they don’t reveal their identity to the public. We are just three friends that want to bring premium Mexican snacks to consumers, both in the quality of the product and the packaging.